Family discount: 5% discount when there is one child under 18 on board. 10% discount when there are at least two children under 18 onboard on the day of departure. Belgium : for one week rental minimum (except for the Ryner Cruiser 1400 model) : 10% discount for two persons with children under 16. Except in : Cahors, Woubrugge, Ireland, Poland. Pont à Bar and Redon: only for one week rental minimum, in Fürstenberg and Potsdam : only for one week rental minimum (not applicable to family rate). In Italy : no discount. 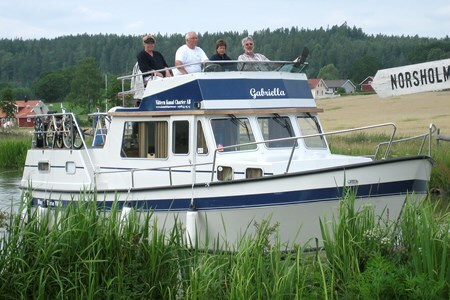 Flotilla discount: 5% discount when 2 boats are cruising together. 10% discount when 3 boats are cruising together. 15% discount when 4 boats or more are travelling together. Except in : Pont à Bar, Ireland, Poland. In Furstenberg and Potsdam : 5% discount when 2 boats are cruising together and 8% discount when 3 boats or more are traveling together. In Spain : 7% discount when 2 boats are cruising together. Loyalty discount: 3% from the second reservation; 5% from the third (may be combined with other offers). Budget fleet : Espade 930. Renaud 8000 (except in Cahors). Espade 850 Fly. Penichette 935. Eau Claire 930 (in Redon only for 1 week minimum). Eau Claire 930 Fly. Classic fleet : Triton 860 (except in Cahors, Italy. Redon : only for bookings of 1 week minimum). Triton 860 Fly. Nicol’s 900. Linssen Vlet 1030. Linssen Yacht 36. Haines Rive 34. Viking 1000. Except in : Cahors, Pont à Bar, Woubrugge, Belgium, Ireland, Italy, Poland, on the Kormoran and Vetus 1200 K3 boats and in Germany (excluding Potsdam and Fürstenberg). Tarpon 37 Duo Prestige) and 15% for less than one week bookings (except in : Cahors, Redon, Italy, Czech Republic, Kormaron and Vetus 1200 K3 boats and in Germany).